Inside the beautifully maintained village of Stonegate East, this like-new home boasts a bright open floor plan loaded with upgrades. Wood floors, new paint, and upgraded carpet throughout this home reveals pride of ownership and attention to detail. Enjoy cooking in the gourmet kitchen featuring granite countertops, stainless appliances, state-of-the-art refrigerator with filtered water line, abundant cabinetry, and large island. Casual dining area in addition to bar-style seating opens onto a generous great room perfect for intimate family dinners or entertaining guests. Built-in desk and drawers create an efficient workspace, and beautiful plantation shutters frame all the windows throughout the home. The intimate patio retreat with evening lighting is an inviting place to host friends or relax after work with alfresco dining. Upstairs, the generous master suite offers raised stone counters, double sinks, storage, and coveted custom closet built-ins. Two bright secondary bedrooms, bath, and laundry provide conveniences for everyone. 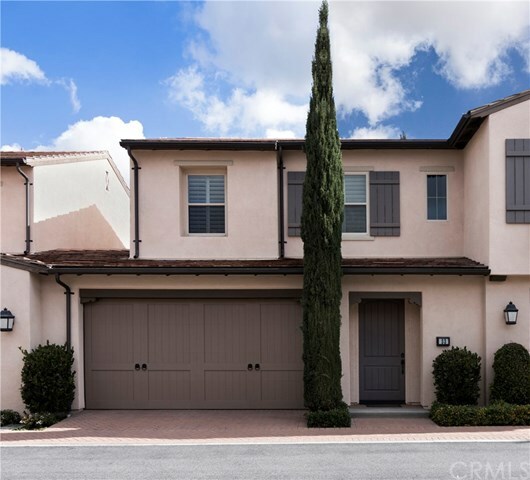 This home is just a quick walk from the village's pool, park, and sport courts, and also offers residents access to new, highly-acclaimed Irvine schools.